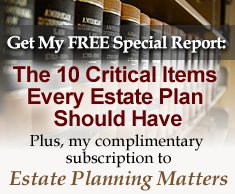 How Often Should I Update My Estate Plan? | The Levin Law Firm - Philip Levin, Esq. Many clients and advisors make the mistake of thinking that once they have established their estate plan (i.e., Will, Trust, Powers of Attorney) they won’t have to change or update these legal documents. Since change is the only constant, please remind your clients that estate plans should be reviewed and updated on a regular basis. Some of the most important reasons to modify an estate plan are whenever there are significant changes in personal, family, or financial circumstances. Change in marital status, including marriage, divorce, separation, or death. Both spouses, or the surviving spouse in the event of death, should update their estate plan upon a change in marital status. Loss of a child or the addition of a child in the family, whether by birth or adoption. If the client has remarried and now desires to leave assets to new step-children, they will need to revise their estate plan. If not legally adopted, step-children have no claim to any assets of a step-parent unless specified in estate planning documents. Move to a different state. The laws of different states can vary considerably. For example, community property and common law states differ on their views of property ownership. States also have different inheritance tax rules. Therefore, couples should review their estate plans when they move from one state to another. Change in income or wealth of either the client or a beneficiary. Your client may decide to change who gets what property, and how much property, based on changes in their own personal circumstances or in the beneficiary’s. As the client acquires or disposes of property, he or she should review their plan, with the assistance of a competent estate planning attorney, to ensure that significant changes are taken into consideration. Of course, if the client is leaving all assets to one beneficiary, it may not be necessary for the client to make changes to the estate plan when assets fluctuate in value. Major tax law changes. Major changes in tax laws can affect how much tax the client’s estate or beneficiary pays on property which is inherited from the client. The client will want to consider how those taxes will be paid by the estate or surviving beneficiaries. Spring is an excellent time of year to meet with clients and suggest reviewing and updating their estate plans. Please contact Laura at The Levin Law Firm to arrange a complimentary consultation with attorney Phil Levin to discuss the estate planning needs of your clients.